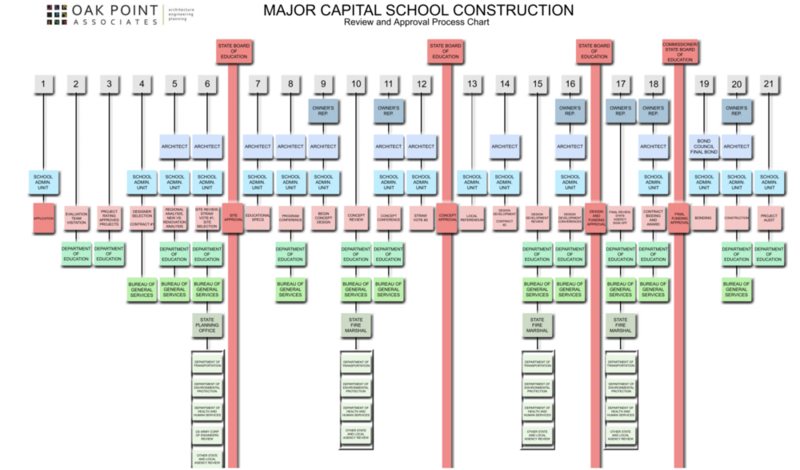 This flowchart illustrates the process every district must follow for new school construction. As of today (Feb 1st, 2016) we are working towards completion of Steps 6 and 7. Step 6 relates to Site Selection. We are currently in the process of determining the right piece(s) of property for our new school. Once soil assessments, usability studies and appraisals have been completed, a public forum will be held to discuss the results. With a positive straw vote and approval by the RSU2 School Board, the site selection will move to the Maine DOE and the State Board of Education for approval. Step 7 relates to Educational Specifications. This is our vision for the new school. After soliciting input via community forums, surveys and student questionnaires, Principals Emery and Barksdale are now compiling these ideas. The finished document will guide the architect in developing the concept for the new school. These specifications are more about the function of the school and less about form. At this point, we need to focus more on how the school will be used (both by students/staff and the community) and less on what color the carpet might be. Download the flowchart PDF document by clicking here.